Review Context: I have not played the original Hotline Miami. 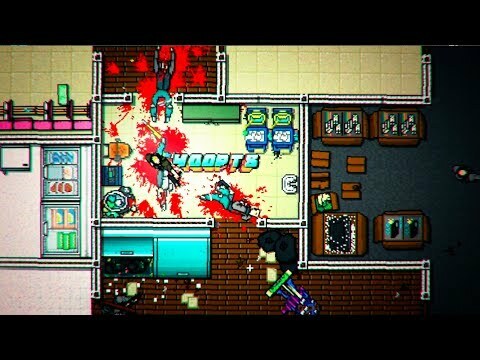 Hotline Miami 2: Wrong Number is a fast paced, 2D, topdown, action, score attack game in which the player attempts to kill everyone quickly and with as much variety as possible. Twenty-five levels of hectic and bloody chaos are wrapped in an extremely weird, yet interesting story. Hold onto your masks boys, things are about to get messy! 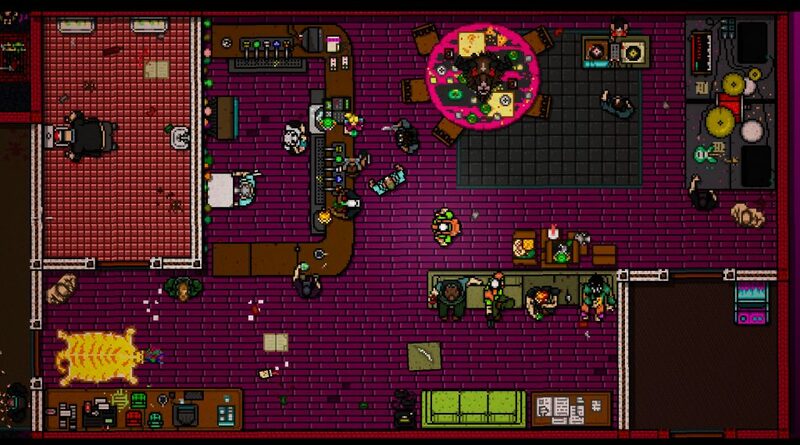 Hotline Miami 2 is a heart thumping romp of adrenaline. The action moves so fast and the deaths are even quicker. Combine that with the desire to go as fast as possible, get as many points as possible, and you get a game that plays like a crazy action scene from a movie. Hotline Miami 2 is just viscerally fun. Killing ten guys in a flurry of swings, head stomps, and gunfire is very satisfying. Hotline Miami 2 can also be very difficult. Everything kills you with one hit and quite swiftly. One wrong move, one missed swing, one ammo-less click of the gun and you’re dead. The controls are precise enough to be reliable but everything happens so fast that it is easy to make simple mistakes. The engine and the way the levels work are structured enough for you to think about how you are going to attack it. When you die everything resets and people are in the same place with the same weapons so you can figure out which is a good idea and what gets you killed repeatedly. But there is this randomness to the system; people don’t always run the same way when they see you, people sometimes do hear the gunshot and sometimes they don’t, people sometimes don’t see you when you walk past a window and sometimes they do. This leads to the player having to react quickly as well as plan ahead. Some people might find this randomness frustrating though. The same thing might not work twice and often that is viewed as cheap or unfair. I think this makes Hotline Miami 2 unique and more interesting. You can’t just figure out the pattern and then perfect it, you have to get good at dealing with the hectic randomness that is Hotline Miami 2. The mouse and keyboard controls are tight and very easy to learn, since its only seven buttons in all. They are fully customizable; with WASD to move, mouse to aim, Left Mouse Button to shoot/melee, Right Mouse Button to pick up weapons, and spacebar to ground finish/special ability as default. There is a small glitch in the control change menu for the LMB command if you change it from LMB to something else, when you change it back the game wont properly display that LMB is the key for that action. It doesn’t affect the game, but if the controls aren’t right for some reason simply going through again and setting each action to the desired key will fix the problem. You can play with a controller too, but mouse aiming is always more intuitive. Its very simple, all things considered, but that doesn’t mean you wont spend an hour on one mission trying to string together the longest combo possible. The graphics are nice and simple with pixel art, lots of blood, and some rather disturbing images. The game is themed to seem like a video that is playing out. Every chapter is a movie and every stage is a scene in said movie. Even when you pause the game it looks like pausing an old VHS. While this is irrelevant to the story, its a cool theme that lends itself very well to the acid trip of a storytelling job Hotline Miami 2 does. 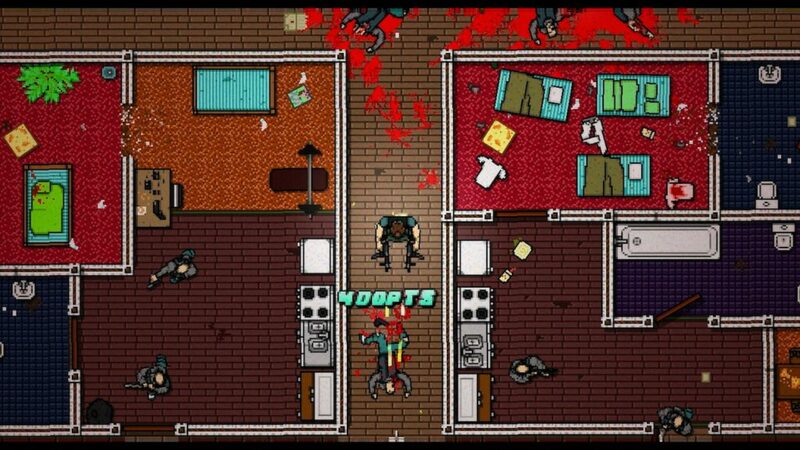 The story takes place before and after the events of the first Hotline Miami. Told in the same style, the story constantly flips between multiple points of view, with some directly relevant to each other and some not. The plot is somewhat hard to piece together, which a lot of people find fun today, myself included. However, having not played the first game, the story was entirely lost on me. The story is disturbing and interesting but luckily, just like how every game today should be, the story is completely skip-able allowing the player to get right to the crazy action if they so choose. Though there aren’t as many masks as there were in Hotline Miami, the masks you get in Hotline Miami 2 are fun and allow the player to play the way they want to. With all the shiny new weapons they added, Hotline Miami 2 can fit anyone’s play style and keep things interesting for a good while. The level editor is very well built too. All the assets in the game are in a neat and organized drag and drop menu that lets you design with ease and then share straight through the Steam Workshop, just in case hadn’t had enough fun yet. All in all, Hotline Miami 2 is a great adrenaline rush for anyone looking to cause some action movie like havoc. A quick gameplay loop and a score attack system are a recipe for an addictive and exciting experience. It’s easy to pick up and jump in, whether you are a newcomer looking for some fun or a veteran ready to piece the story together, there is plenty of content to enjoy and plenty of skulls to crack. Just don’t forget your mask.